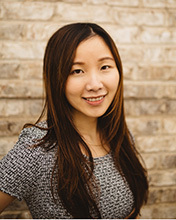 Teresa Hsu is a key member to the staff here at Pinnacle Accountancy Group. She has worked with one of the partners for several years before joining our team. Teresa is from Taiwan and knows three languages: Mandarin Chinese, Taiwanese, and English. She graduated from Westminster College with Double Degree in Accounting and Finance. While attending Westminster College she served as the secretary for International Student Association, and is working on her CPA certification to be completed within the next year or two. In her spare time Teresa enjoy cooking, backing, hanging out with friends and spending time with her family.